Rajaraja Chola I ( 985 to 1015 CE) was an unequalled monarch who ruled the entire Southern part of India over thousand years ago, whose greatness and glory can still witnessed by the world by his magnum opus the Brahadeswara Temple in Thanjavur. 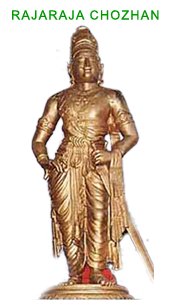 He was born Arunmozhivarman, the second son of the Parantaka Cholan II alias Sundara Cholan and Vanavan Mahadevi. His brother the crown prince the Valiant Aditha Karikalan was assasinated and there was a political instability which followed this. Even as a youngster when all the people of the country wanted to crown him as the ruler, he declined and relinquished his right and requested his uncle to rule the mighty Chola kingdom to avoid any ill feelings in the family and waited for fifteen years to become the monarch and ruled for thirty years from 985 to 1015 which was the beginning of the golden age of cholas. Its not an exaggeration to call RajaRaja Chola an all round genius earning him the various titles which can be found in his inscriptions. He was valiant warrior and a master strategist who built his empire by his might of his army, navy and political treaties. He paid meticulous attention to the welfare and comfort of his people. 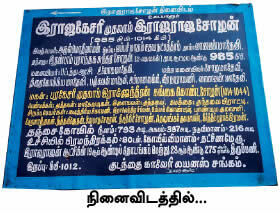 His local administration and civil administration system was par excellence. Rajaraja built the Great temple of Thanjavur and covered the two hundred feet high tower with gold to signal his contribution. The temple survives to this day in its original grandeur. It is a magnificient haven of architecture, sculpture and paintings. His rule demonstrates the equality and liberty the chola women enjoyed. His sister Kundavai and queens possessed property in their own names, which they donated to charity, temples and infirmaries and issuing orders with equal validity as that of the Emperor. 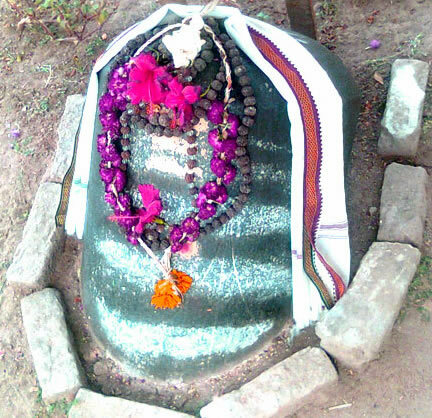 Rajaraja was a staunch follower of Saivism but ensured religious tolerance and patronized all religions Saivism, Vaishnavism, Saktam, Jainism and Buddhism alike.